Anyone in the market for a super portable display may be worth giving the new SPUD monitor a little extra investigation. As the 24 inch display is a lightweight solution that can easily provide you with extra display real estate when required and collapses down into a small carry case. 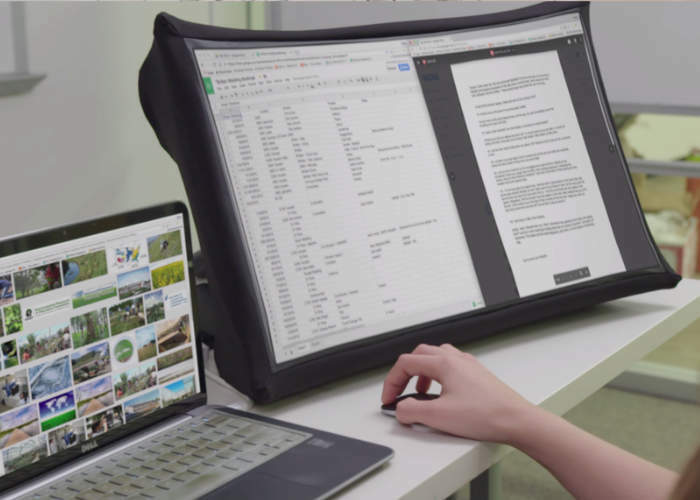 Watch the video below to understand more about its unique collapsible design and how it can easily transform into a secondary 24 inch display that uses custom optics combined with the latest DLP technology. SPUD has this week launched by a Kickstarter and already raised over $132,000 thanks to over 320 backers with still 44 days remaining on its campaign. The developers of SPUD explain a little more about its design and functionality. SPUD is the only high resolution, 24-inch display with the awesome benefit of ultra-portability. It collapses just like a ruggedized umbrella to the size and weight of a paperback book – making it ideal for anyone on the go. From watching movies on the go to being more productive while away from your office, SPUD optimizes the visual experience on practically any device. Just for our earliest community of supporters we are offering discounted pricing from the $499 projected retail price. For more information on the new SPUD jump over to the Kickstarter website for details by following the link below.